KJR power sanding accessories make sanding easier and more affordable than ever. Available in 2" and 3" sizes, these deluxe sanding kits include everything you need to power sand most any project. 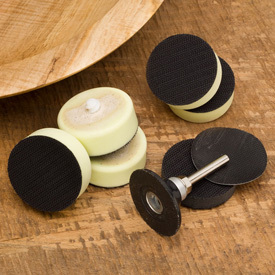 And, with a full range of inexpensive backing pads, quick-change Roloc® backing pad holders, and interface pads, you can customize your sanding system in a way that works best for you. The concept behind the KJR sanding system is one that many professional woodturners have been using for years with great success. It’s a proven technique that simplifies the sanding process while helping your valuable sanding discs and holders last much longer too. At the heart of the system is a Roloc® quick-change holder that allows you to change backing pads with a quick flick of the wrist. Comments On Oct 02, 2017:I give it 4.5 stars. I like this system for sanding. Previously I was using just strips of turners sanding paper. As previously noted, you can only sand in one direction, and you have to be a little careful on how you introduce the pad to the wood or it will unscrew by itself. My only real complaint thus far is I wish it had a an option for a thinner pad for some of those tight areas. I recommend getting enough pads for all your sanding grits. It is very easy to change pads and preserves the hook and loop. I keep a labeled zip lock bag for each grit of Deerfos paper and a pad for each one. It is much faster to attach a pad than it is to keep the same pad and attach/re-attach paper. Comments On Mar 12, 2017:This is a great idea. I bought both the 2" and 3" kits. There is a down side that I didn't think about. You can only spin the disk in the forward/clockwise direction, otherwise the pads unscrew.